There has been much talk on Twitter lately regarding Macarons. Somewhat of a challenge was launched, so I decided to try making them myself. From what I have read on the subject, Macarons are notoriously tricky to get right. The temperature in your kitchen will also play a key role in the success or failure of the Macarons – cool/cold kitchen, rather than a warm one. Overall technique, i.e. gentle folding of the almond mix into the egg white, is also essential. 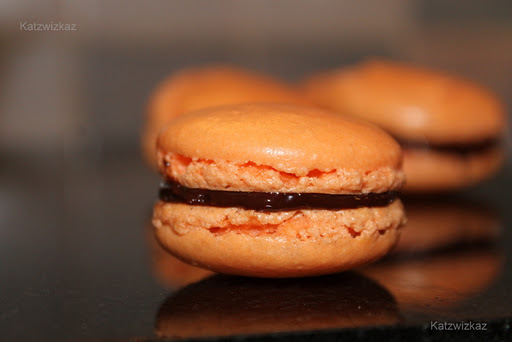 So, for Hallowe’en, or anytime, here is my version of Macarons. *Pre-ground almonds tend to have flecks of almond skin in them, and these need to be removed, as it spoils the overall look of the macaron. Line a baking tray with a sheet of non-stick paper (parchment) and draw circles 1 1/2″ wide, and 1 1/2″ apart. Turn the paper over. In a food processor, blitz the icing sugar and almonds together, until they are very finely blended. In a free-standing mixer, whisk the egg whites, until they form stiff peaks. Slowly, and a little at a time, add the caster sugar. Next add the colourings and flavourings, and whisk again, to ensure all are combined. Sift the icing sugar and almonds into the egg whites, fold in gently, again, a little at a time, until the mixture has been used up. Put the mixture into a piping bag with a nozzle attachment. I used a Wilton No. 12 piping tip. Holding the piping bag firmly and vertical to your baking tray, place the nozzle in the centre of the circle on the paper, and pipe out the discs. Tap the tray on a work surface to remove any little air bubbles which may form. 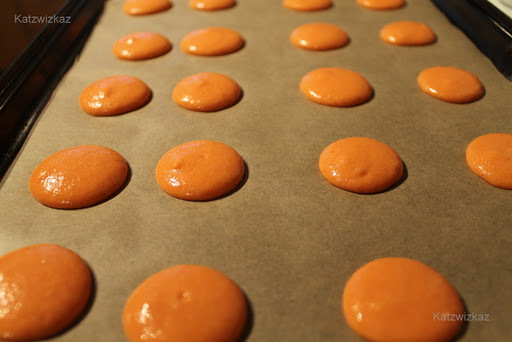 Leave to stand for between 15 and 20 minutes, so that the surface of the macarons form a thin skin. Bake in the oven for between 18 and 20 minutes. Allow to cool on your baking tray before placing on a wire rack. The tell-tale sign of the macaron being cooked is the little frill, or foot, around the base. For the Chocolate Ganache filling, I used a recipe from the esteemed Mr. David Lebovitz. Tricky, yes, but the treat is in the tasting. Fantastic looking – so professional! I bet they tasted good too! Thank you Amee. They tasted great. The chocolate ganache is lovely and rich, and compliments the orange beautifully. They look beautiful. Orange and chocolate is such a nice mix. Thank you Magda, always a great combination, and an easy one to start off with. Have been very very wary about trying macaroons! But just might be tempted! Thanks Margaret. So was I, as I don't like ground almonds (you can't taste them), and all that can go wrong. But try them, and if they don't work, try again. They will always taste great, even though they mightn't be the best "lookers"! Thank you, Breige, they take time to "perfect", but once you do, they become addictive. 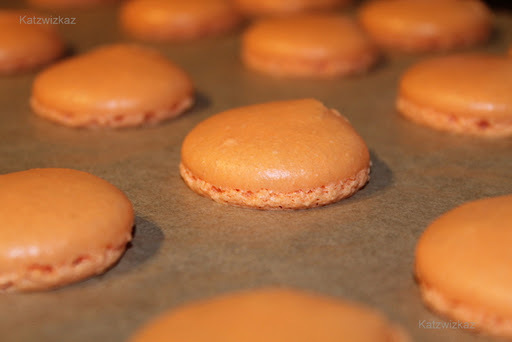 They look divine, have a hundred, at least, recipes for macaroons but haven't made them yet, making means eating and I try to avoid temptation – lol! Your orange chocolate combinations is right up my street! Thank you, Caroline. They are addictive, once you start making them, to get them right. Then, it's just a matter of picking your own flavour combinations. Thanks, Val, they were great, but with Macarons, you could make them today and they would be great, make them tomorrow, and they might not! Have to make more, just to test out that theory.